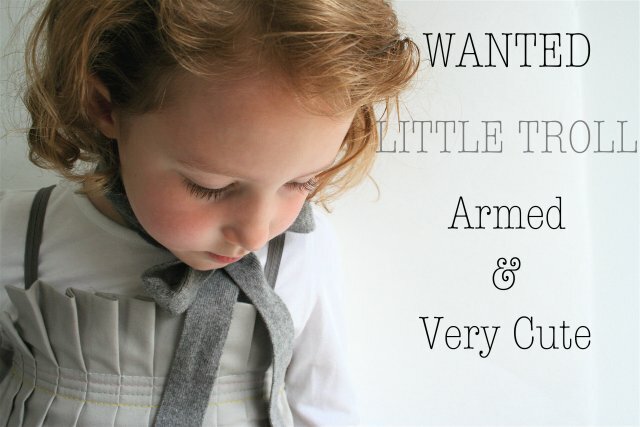 Here are a few press articles on Little Troll and the start of the collar accessory concept. So, when a beautifully stylish French lady asks you to do an interview on her Blog site how do you say no? Well you don’t, you say yes, of course! And are flattered that anyone would be interested! Amongst all the truly interesting people I had the pleasure of meeting at Bubble was Florence Ronaldo, curator of PIROUETTE, a style blog reflecting all things children for those in the business and parents looking for inspiration. Thank you Florence for asking, check out Pirouettes blog and the interview here. I have been so lucky to meet so many nice people over the last few months, one of whom is Ursula. Ursula is the designer behind Room to Bloom, a site and business designing interiors for children. We met at Bubble trade show and she has done lovely things with our Sherbert Sketch dress! I really think the room she has designed around dress invokes it, its so clever. I would love a room like that for myself. Here is a lovely post from Linda McLeans kids great fashion blog Smudgetikka on my autumn/winter collection. 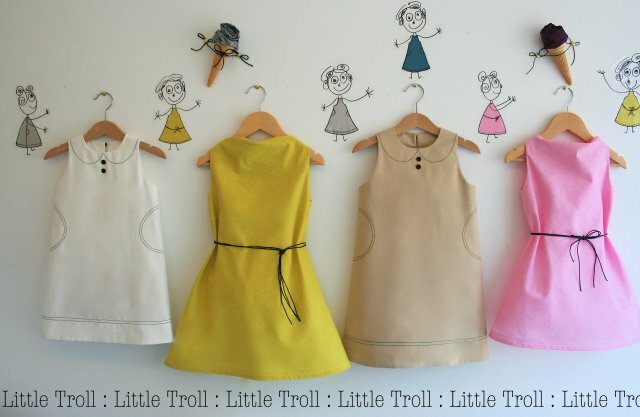 I really like the minimal style of British kidswear brand Little Troll and the graphic simple dresses for girls they produce. With a collection based on just 7 main dress shapes they are able to ring the changes through fabric use and accessorising using a great range of collars and belts in different prints and colours. The idea of the collection is to make a little go a long way. For next winter children’s collection there are monochrome prints which follow the trends in womenswear fashion and strong solid colours such as red, petrol blue and mustard as well as a chic Parisian style silver grey. Well we all love a bit of styling don’t we and I met some lovely photographers and stylist at the last trade show we attended. The Autumn / Winter collection grabbed some great attention and it was asked out on lots of dates to have its photo taken by many of the afore mentioned. Well, you just don’t know what will happen on most dates do you so you have to pack off your baby, aka the collection, ask it to mind its P’s and Q’s, be on its best behaviour, smile for the camera and hope no one takes advantage! Once your baby is returned safely with no signs of ruff and tumble you just gotta wait and see what has been dreamed up by everyone. Well, the first shots from one of those dates has just come in and are here for you to see. Our Autumn/ Winter collection has a theme of ‘DRESS UP” and all the dresses, skirts and T-shirts have a huge collection of separate collars and belts to mash up your outfit and have fun mixing up the looks. Here stylist Alison Fitzpatric and Photographer Jonathan Malpass have used our Little Red Flat Collar and Large Cloud Belt to style there shoot for Kikimora Magazine.